Do Kite Stunts, Become An Aerobatic Pilot While On The Ground! Without ever leaving the ground! To keep things simple, I'm going to just talk about doing kite stunts with 2 line kites. That's a good place to start anyway, before moving up to those fancy quad-line kites. Apart from the kite manufacturers, very few people would build anything for doing kite stunts these days. The shop bought ones are so good, and some of them aren't too expensive either. 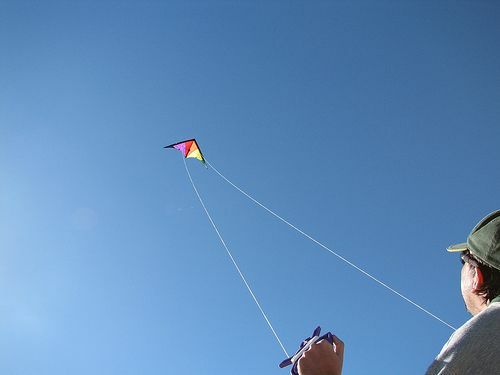 Just to add a bit extra to the spectacle, many shop-bought kites these days are designed to be easily 'stacked'. This lets you fly more than one kite at a time, on one set of lines. I have memories of an expert flier doing kite tricks with 3 tiny black deltas, stacked together and zipping around very fast in a stiff breeze. That was at the Adelaide International Kite Festival, back in March 2007. If you browse around the Web or even the local kite shop, sets of instructions aren't hard to find. 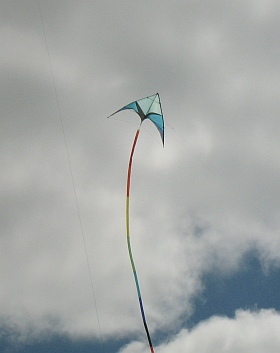 In fact, many kites come packaged with brief instructions or even a CD ROM to play on your computer. I'll highlight a couple of particularly good write-ups on flying stunt kites now. Firstly, David Gomberg is the author of a well known book titled Stunt Kites! and has published an extract on the Web. It's a great, informative introduction for beginners, called Flying Basics for Dual Line Sport Kites. It covers the basics, for example laying out the lines, steering and choosing where to fly. Secondly, Jim Mayfield is another recognized kite expert and has published a somewhat more detailed guide for those wanting to get into doing kite stunts. He also touches on Diamond stunters in a couple of spots. Titled How to Enjoy your Dual Line Stunt Kite, it also has sections on such topics as bridle adjustments, doing repairs and flight tuning. The diagrams scattered through the text really open up the nitty-gritty of sport kite construction and flight. As Jim says, this info-packed article sums up the experience gained from many hours of flying time. He invites you to study it and get a head start! Save yourself time and money. You know, it's really pretty easy to sum up the safety aspects of flying stunt kites. Just have a good look around your flying site, and imagine every single thing that could possibly come into contact with your kite or its lines! Keep in mind you might have to back up a few steps while doing kite stunts, too. Can't see any problem? Time to fly! About the only other thing to consider would be to not fly in bad weather. Lightning and/or very strong wind don't mix with sport kite flying! That's just common sense. OK, Some Actual Kite Stunts! Anyone can fly a few loops and figure 8's and zip around here and there in straight lines. It's easy to pull the left line to loop the kite left or maybe pull one line and push the other at the same time to snap the kite around in a really tight turn. 'Pull turns' and 'combination turns' they're called, and they're the basis of most kite stunts. There's a little booklet available for just a few dollars in kite shops that's good for this. It's called Sport Kite Precision Maneuvers by David Gomberg. There's that name again. :-) You can test your skills by learning to fly such stunts as Ladder Down and Eight In A Rectangle. Want to get a bit more official? Ok, there are the Dual-line Individual figures, from the International Sport Kite Compulsories Book. If you ever consider entering competitions, there are just 15 figures to learn if you're not in a team. But what do these kite stunts actually look like I hear you asking... How about seeing some animated graphics on the Web! Check out this web page created by a very skilled webmaster who has taken the trouble to re-create the movements of a kite going through all the standard competition figures. Once you are at the page, just click on a maneuver name to see an animation. For example, Circle Over Diamond is one of the kite stunts. You should see a grid overlaid on a moving cloudy sky background, with a little kite flying along a red line which represents the figure. You can turn the grid on and off, and also remove the red line if you want to. The moving kite can be paused and re-started too. Some technical info, in case you find the animations don't work. I have tested a few of them using the Internet Explorer browser (V7) and the Mozilla Firefox browser (V2 - V9) with the latest Flash plug-in installed. Most browsers should work fine as long as the Flash plug-in is at least version 4. In alphabetical order, and some of them I know nothing about except their name... Yet. Austin End Of The Line. These guys take part in demonstrations, performances, training and competitions. The members are Eddie Zihlman, Ben Gray, Jim Cox and Michael Boswell. Austin EOL was formed in 1996. Chicago Fire is apparently the oldest competitive sport kite team in the United States. They have been competing and demonstrating team sport, aerial ballet and precision kite stunts since the 1980's. Colored Dreams is a successful German stunt kite team. Garuda is from Germany, and are into sport kite competitions. Kite-O-Holix is an Austrian competition and display team. OOPS! My Fault is a three man stunt kite team from Oregon, U.S.A.
Postive Lift are from here in Australia, consisting of Joanne Baker, Maggie Phillips and Ricky Baker. They demonstrate all forms of kiting, not just stunt kiting. Scratch Bunnies. Mmm. Do they perform in those pink bunny ears? SPI is a very competitive stunt kite team from Texas U.S.A. The TKO stunt kite demonstration team has been a hit at many major kite festivals. Consisting of 4 guys - Troy Gunn, Chris Shultz, Shane Snowden and Jerry Hershey. Too Much Fun consists of Mark & Jeanette Lummas, Ron Despojado and Susan Shampo. A bit unusually, they are one of the few multi-discipline stunt kite teams in the world. In other words, they don't fly just dual line stunters, but quad liners and trick kites as well. An American team, they have performed at the Superbowl. As an Australian, I'm guessing that's a pretty big deal in the States! Up Against the Wall is another successful German stunt kite team. U4RIA is a Belgian kite team that claim to 'boldly go where our kites have gone before'. Visual Impact are Dan Villegas, Jim Barber, Rick Wolcott, Reid Wolcott and Mary Bos. Windjammers are a 6-man stunt kite team. These guys formed their group in 1983, making them one of the oldest teams around. First names are Aaron, Nate, Gary, James, Mike and George. Over the years they have performed at a wide range of public events and competed in many competitions. They have a thing about kite trains. Or at least they did in the 80s. In 1984 they flew a record breaking train of 76 Trlby kites.